Since our founding in 1989, Clearwater Landscape & Nursery has received numerous awards and extensive recognition as one of the premier landscaping companies in the Washington, DC and Baltimore, MD metropolitan areas. To learn more about the many awards we’ve earned over the years, we invite you to explore the listings below. 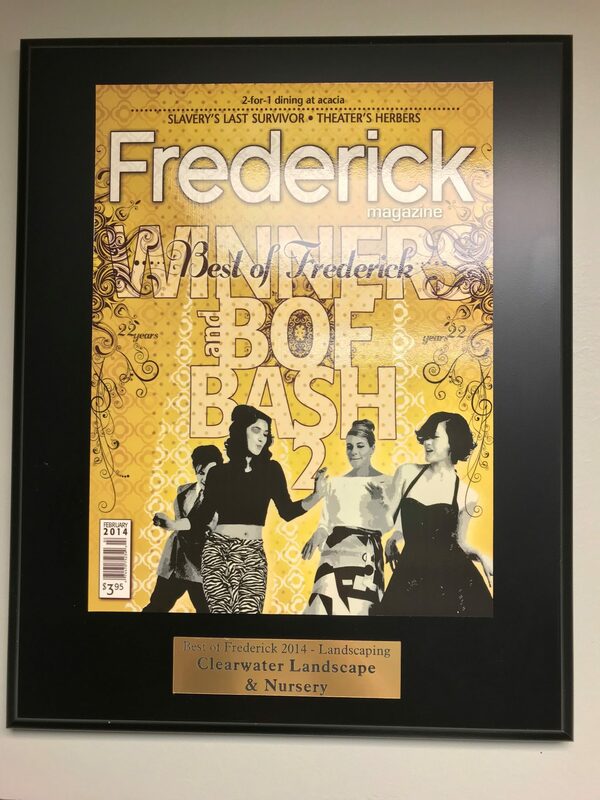 Thank you for voting us Best of Frederick 2018! We truly appreciate your continued support and loyalty to our company! 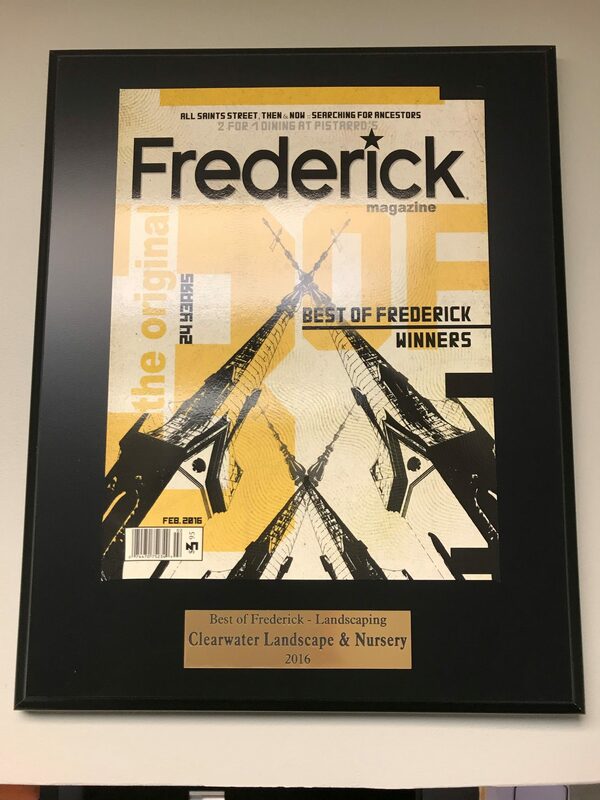 We are honored to be Best Landscaping company for Frederick Magazine since 2008. Thank you for your support we are truly appreciative! Thank you for voting us Best Landscaping company for Frederick Magazine. This is our 8th consecutive year! We really appreciate all of your support! We were voted Best Landscape company by voters for the 7th consecutive year! Thank you for your continued support. We appreciate your business. We really appreciate the support from our community. 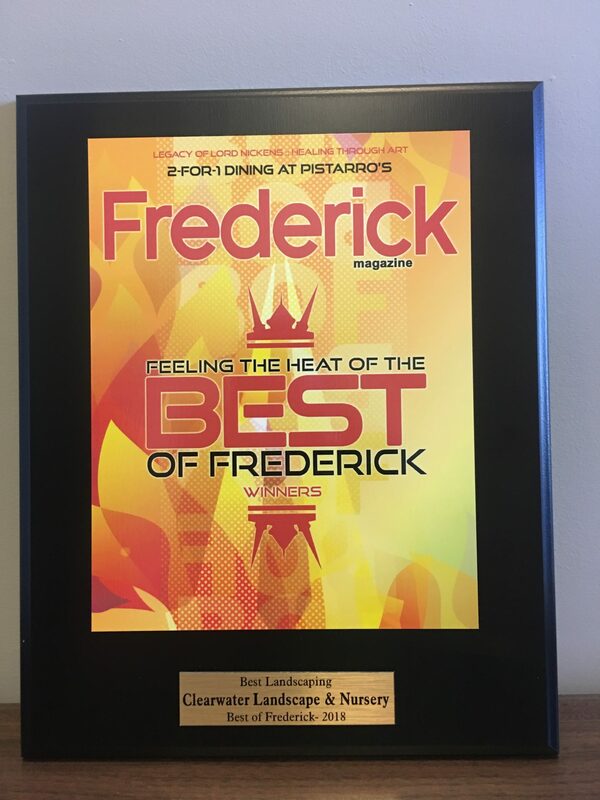 Thank you for voting us Best of Frederick for the sixth year in a row! Thank you! Thank you for voting us Best Landscaping Company of Frederick for the fifth year in a row. We really appreciate your support and loyalty. The FCBIA Media Marketing Awards of Excellence offer recognition in advertising based on concept, originality, design, and how it relates to the target market. A big “thank you” to all of you who voted us “Best Landscape Company of Frederick” for the FOURTH consecutive year! We are thrilled to be recognized by such a great community! We will try our best and work our hardest to uphold this award. Do not hesitate to call us with any of your outdoor living needs. We look forward to discussing your landscape with you! In their first-ever survey and analysis of more than 1.2 million members, Houzz.com reveals top-rated professionals and current design trends from across the country. Clearwater is honored to have received a “Best of Remodeling Award” in the design category. The FCBIA Outdoor Living Awards of Excellence offer recognition for creative and functional designs of outdoor spaces and landscaping, which enhance the home or community. 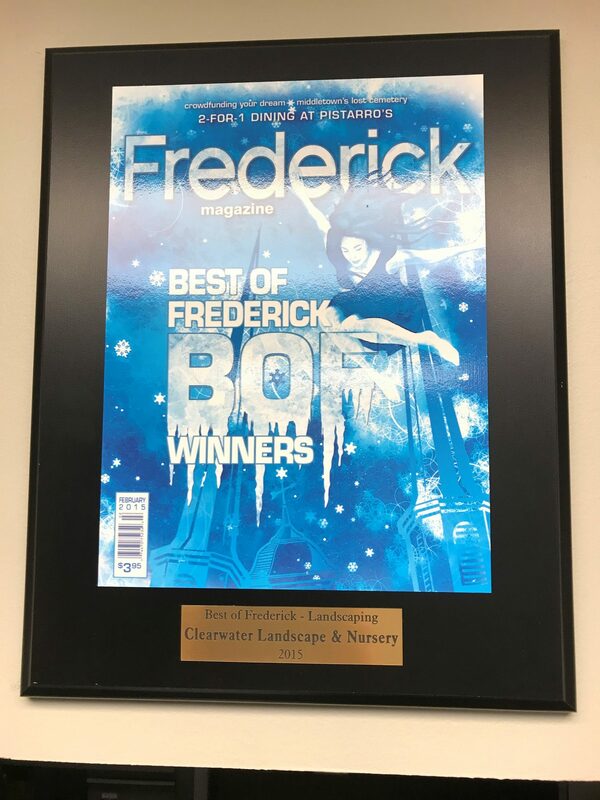 For the third consecutive year now, Clearwater Landscape was voted Best of Frederick in the landscape category by the readers of Frederick Magazine! Thank you again for your recognition! As always, we are honored to be able to continue serving all of your outdoor living needs. This year, Clearwater was awarded Best in Show at the Frederick Home Show—a step up from last year’s Best in Landscaping. Thanks to all of those that came and stopped by our booth! Standing in rural Frederick County, MD, overlooking the newly completed backyard of our client’s home, you get the feeling that you are visiting an exclusive resort. It’s hard to believe that just a year ago, the back yard of this property was nothing more than a steep hillside of lawn. This year, Clearwater was awarded Best in Landscaping at the Frederick Home Show—an award we are honored to have received. Thank you to the Frederick County Builders’ Association and of course all of those you came out to the home show! This design was prompted by the owners’ desire to enhance the rear yard of their newly constructed residence in Montgomery County, MD. When the owners stumbled across this property, with its views of Sugarloaf Mountain and surrounding beautiful farmland, they saw the potential in the lot and instantly fell in love with the property. Upon completion of the construction of the home, the owners then turned to the exterior, with hopes of making the property as inviting as the interior. 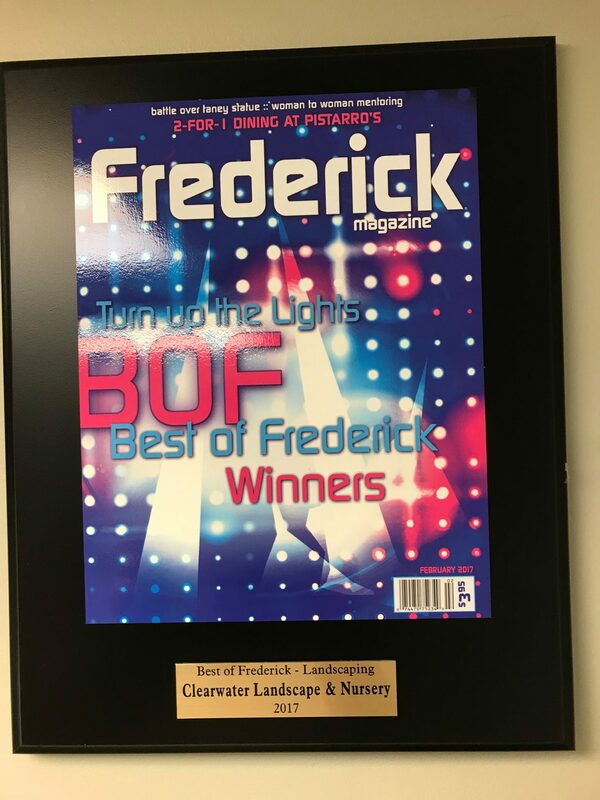 Clearwater Landscape & Nursery would like to thank all of Frederick Magazine’s readers that voted us Best Landscape Company of Frederick. What an honor to be recognized by our home town! Frederick has many reputable landscape companies, which makes this an even greater honor. The Inc. 500|5000 is ranked according to percentage revenue growth from 2005 through 2008. Clearwater’s achievements have earned the rank of 4,487 on this year’s Inc. 5000 list. Read more about the criteria and ranking method and make sure to check out our profile on the Inc. 500|5000 website. 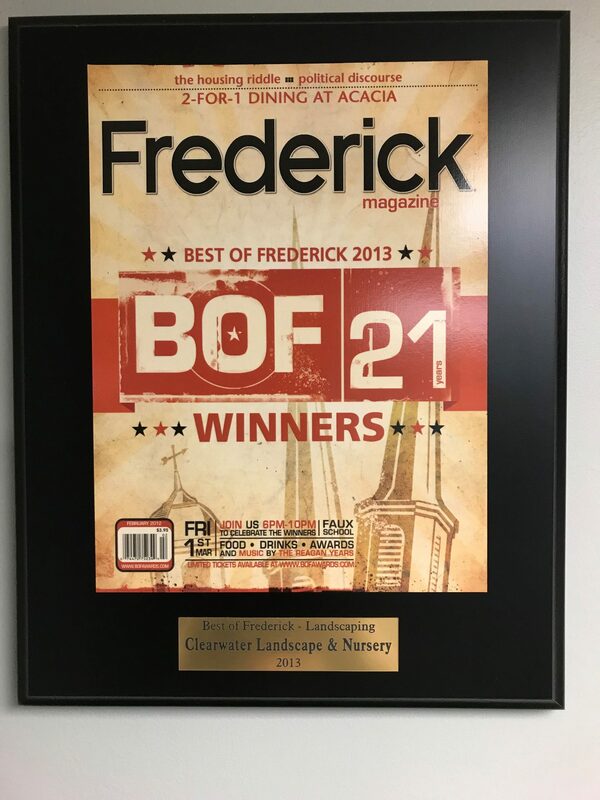 For the second consecutive year, Clearwater Landscape was voted Best of Frederick in the landscape category by the readers of Frederick Magazine! We thank you all for your continued support. We are honored to be able to continue serving all of your outdoor living needs. This design called for a warm and cozy space for outdoor dining and lounging. The natural stone caps, dry stack walls, and irregular flagstone patio harmonize with the cedar pergola, existing woodland, and custom planting beds to create a peaceful backyard retreat. A bubbling urn fountain was added as a decorative element as well as to create a pleasing sound through the space. This outdoor living area was designed to have different levels of seating with varying degrees of style. The upper patio displays more formal seating and dining areas and features a stone fireplace and outdoor kitchen. The pond beside this upper patio falls with the natural grade of the site, leading to a larger lower pond beside a more relaxed seating area and firepit. The clearly separate spaces remain connected by the planting beds and water flow, in addition to the views from one to the other and their shared view of the distant hills. After 20 years of custom landscapes, Clearwater Landscape & Nursery has been recognized in Landscape Management Magazine as one of the top 100 companies in the nation. Clearwater was established in 1989 by owner Michael Rempe. Starting out completely on his own, Michael catered to residential builders with small retaining walls and planting services. Over time, Clearwater has expanded to staff over 70 full-time employees at his 20-acre facility in Maryland. This integrated team of professionals includes landscape architects, designers, licensed horticulturalists, and certified technicians to provide custom design, installation, and maintenance services. Although the company has grown to have an extensive management team, Michael is still present at the office daily and keeps aware of all projects in progress. He takes pride in this award-winning operation, its great workmanship, and its superior customer service. This residential landscape was to include a formal front yard and entrance, which was achieved with a stone-walled courtyard and a focal specimen planter. The back yard includes an outdoor living area with room for a removable grill and plenty of room for seating and dining. The design also took advantage of the drainage swales by installing a river jack stream bed with accent plantings. Other features include a paver driveway, custom planting beds, and a tree screen around the property’s perimeter. This client requested a full residential master plan. The front landscape includes a governor’s paver driveway lined with boxwoods and formal plantings at the house entrance. A steep grade change from the front to back yard required a sturdy, well-lit stairway for the client’s elderly in-laws. Other amenities in the backyard were to include a pool, pool deck, pergola, rinse shower, kitchen area, dining area, composite deck with trellis, a place for the children’s play equipment, and a tree screen from the neighbors. This outdoor room includes a stone fireplace and outdoor kitchen. The flagstone patio set in mortar is surrounded by natural stone seat-wall and planting beds to create a sense of enclosure for private dining and lounging. Other features include lighting and irrigation, as well as a lawn area around the room to enjoy the countryside view. This design called for a composite deck, multi-level entertaining and gathering spaces, and a water feature. The designer incorporated the ornamental pools and waterfall with the space’s existing grade change to transition between the different levels of patio. It also creates a pleasant view from the lower french doors of the house. The decorative pergola acts as an eye stop for space enclosure, however, it also allows for views through to enjoy the countryside scenery.